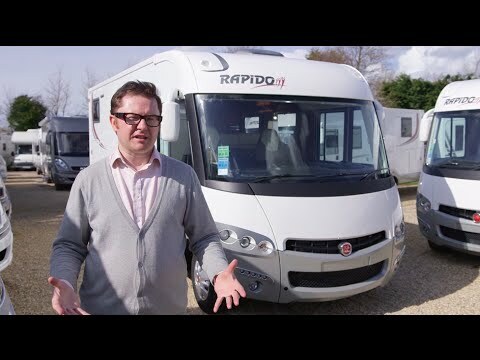 Get inside the impressive Rapido 8066df with Practical Motorhome's Editor Niall Hampton! Could this be your affordable route to A-class motorhome ownership that, with a 3500kg MTPLM, everyone can enjoy? Read our Rapido 8066df review! Rapido motorhomes clearly hit the spot with UK buyers, as shown by the company’s recent chart-topping performance in our 2016 Owner Satisfaction Awards. The Mayenne-based producer collected the gong for highest-scoring manufacturer of pre-owned ’vans, beating off strong competition from leading domestic and German brands. It capped off a strong season for Rapido, which took its stand at the NEC in October having sold out its entire production run for the 2016 model year, at the leading Continental shows. Little wonder: the company’s focus on innovation, specification and comfort has won it many fans. With many sharp offerings at a variety of price points, Rapido’s appeal stretches right across the market with, in our view, particularly good value to be had at the affordable end of the A-class segment. Three new models were launched in the 80df (double floor) series for 2016: two carrying island beds (the 8080df and 8090df), and one with fixed twin singles – the 8066df, on test here. With a base price starting from £60,100, the 8066df could potentially bring the boon of A-class ownership to those already considering an upper-end British or German coachbuilt for a similar outlay. A-class owners enjoy the benefits of a vehicle architecture optimised for longer, more self-contained tours, offering superior thermal insulation properties alongside added comfort, plus the convenience of innovations like double floors for storage. First appearances matter, and the 8066df will turn heads on site. A brilliant white polyester-clad bodyshell, grey skirts and a curved windscreen set into a wraparound black section combine well. In fact, the sweep of the radiator vents, with the red Rapido logo sitting in the middle, gives the 80df series a pleasing visage, framed by the ‘ears’ of the bus-style overtaking mirrors. Inside, the sharp looks continue with ‘Elegance’ cabinetwork, featuring solid maple and brushed aluminium insets, and ‘Canberra’ leather upholstery (a £1900 cost option). A lighter-toned finish, ‘Montalcino’, is also available. Based on the Fiat Ducato with an Al-Ko chassis, the 8066df has an MTPLM of 3500kg in standard configuration, with a 360kg user payload. Assuming that most prospective buyers will have a B+C1 driving licence (the entitlement to drive vehicles that weigh more than 3500kg), the MTPLM can be up-plated free of charge to 3700kg, increasing the payload by 200kg. This was the case with our test ’van, although the addition of the UK Pack (Truma Combi 6 dual-fuel heating, combination oven and grill, cab’n’hab carpets and split lounge table) and other selected options reduced the available payload to 506kg – still a respectable limit for a touring couple packing a range of holiday paraphernalia. As standard, the 8066df is supplied with the 130bhp version of Fiat’s 2.3-litre turbodiesel engine, coupled to a six-speed manual gearbox, although our test ’van had a 150bhp unit (£1080). With the wraparound windscreen and side windows, visibility from the 8066df’s cab is excellent, the lack of a driver’s door pillar on the offside giving even more unobstructed vision for drivers of right-hand-drive versions. At 7.39m long, the colour reversing camera option would be a good box to tick; this costs £490 and can feed a double DIN-sized head unit display on the dashboard. The electrically operated cab mirrors fitted to our test ’van were fitted with de-icers and double view sections, as part of the Look Pack (£460), which also brings LED daytime running lights. Other chassis features include an extra-wide rear axle track for improved stability on the road, and the provision of two belted travel seats in the lounge. Entering through the offside habitation door, the 8066df follows the standard Continental layout of half-dinette and L-shaped kitchen. The comfortable seating feels high quality, and with two side settees, plus the rotating cab seats, up to six people will be able to lounge and dine in comfort. The table can be moved laterally and, as part of the UK Pack, is thoughtfully hinged in the middle to lift up and permit easy access to the cab. Subtle touches in the galley confirm its French-designed origins. The three gas burners are arranged in a line for ease of use, and a smart mixer tap dispenses into a round stainless steel sink. A reasonable amount of preparation space is available with the cooker and sink lids closed, although the lounge table is close at hand for backup. A curved storage unit under the sink will appeal to bon viveurs, with three built-in receivers for wine bottles, while a combination oven and grill (part of the UK Pack) will feed the needs of British cooks. Other kitchen equipment includes a 160-litre fridge with separate freezer compartment, and – fitted as part of the Rapido Pack (£249), a cooker hood fan. Less tech-driven but still very practical are two other details: a spice rack and kitchen roll holder. The units have central locking. In the rear master bedroom, the popular fixed twin single beds take care of sleeping provision, accessed via three central steps. Bultex density foam mattresses and a padded headboard with reading lights head a list of comfort features, which also includes cassette blinds and decorative nets to the side windows. Another two berths are available at the front of the ’van, where a pull-down double is on hand for guests. The bed assembly and folding mechanism feels reassuringly solid, but not too onerous in use, and access to the sleeping space is via an aluminium ladder. This layout uses the split washroom configuration to save demands on body length: the toilet and vanity unit are both on the UK offside, across the gangway from the shower compartment. The vanity unit area’s door latches in two positions: to close off that section, or when opened to separate the front and rear sections of the motorhome for privacy. The vanity unit area’s wall cupboard has a clever mirrored door that slides across to where it’s required. Opposite, the moulded plastic shower compartment has a bi-fold door, plus a retractable clothes line for hanging up wet items for drying. With raised single beds up above, the large rear garage offers a substantial 130cm headroom for bulky items like bikes, scooters or other outdoors kit, and is accessible from both sides of the ’van. Inside, a blown air vent for drying damp items, a light and tie-down brackets all feature. Other storage highlights in the 8066df include a ‘pass-through’ compartment between the axles that runs across the width of the ’van’s double floor. A useful place for long items like skis, it can also be loaded from both sides. Owners of the 8066df can also choose from a wet locker, two compartments in the habitation’s double floor, wardrobes under both fixed beds and nine overhead lockers to accommodate their user payload. Standard equipment on the Rapido 8066df includes ABS brakes, a driver airbag, four three-point seatbelts, coach-style mirrors and a 160-litre fridge. Extras totalling £4805 were fitted to our test ’van, including a 150bhp engine (£1080), 3700kg chassis upgrade (free), Canberra leather upholstery (£1900), piano black dashboard (£160), camera pack (£490), bed cover (£560) and habitation door window (£410). Two options packs were also fitted: the Look Pack (daytime running lights, white coach mirrors with electric control, de-icing and double view panels: £460) and the Rapido Pack (cooker hood fan, gas inverter, cruise control with limiter, passenger airbag, height-adjustable cab seats, manual air con and Pioneer radio and loudspeakers: £249). With the UK Pack, included in the retail price, these items weighed 54kg, reducing the user payload to 506kg. Other further customisations include Alde wet central and space heating instead of the Truma Combi system, and a lowered rear beds option, which can only be specified with Alde heating and reduces the garage headroom to 80cm instead of 130cm. With some carefully selected cost options added, you could still get on the road with the 2016 Rapido 8066df for under £63,000. Considering there are various UK- and Continental-built low-profiles for this kind of money, the 8066df seems like an ideal route to affordable A-class motorhome ownership. The ’van looks great inside and out, and there’s a pleasing vibe inside. C1 licence holders will find no disincentive not to up-plate to 3700kg, bringing up to 200kg of extra payload with it. And to see other Rapido motorhomes for sale, click here.